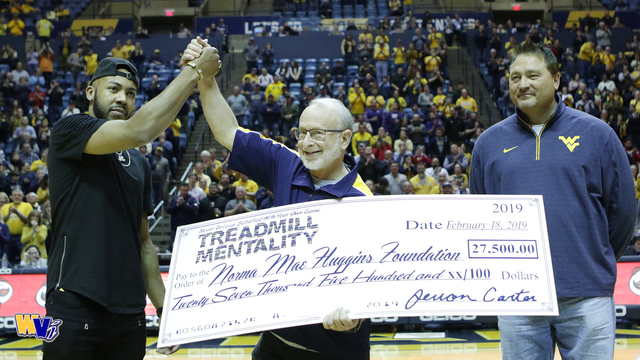 Mountaineer legend Jevon Carter made his triumphant return to Morgantown Monday night. Carter presented a $27,500 check to the Norma Mae Huggins Cancer Research Endowment Fund. Carter raised the money by donating the proceeds from the selling of his “Treadmill Mentality” t-shirts. In his return to the WVU Coliseum Monday night, Jevon Carter (@nextlevel_03) didn't just watch his former team. He also made a major contribution to the Norma Mae Huggins Foundation. The action on the court Monday night was very different than when JC was leading the Mountaineers. WVU held their own against the No. 23 Kansas State Wildcats for much of the game, but the Wildcats pulled away late, winning by a final score of 65-51. After falling behind 40-33, West Virginia surged back to tie the game up at 42-42 going into the media timeout with 11:55 to go in the second half. From there, the patented Mountaineer scoring drought happened and Kansas State went on a 14-0 run while West Virginia was held scoreless for 5:24. Lamont West led the Mountaineers in scoring with 16 points to go along with seven boards. Derek Culver notched a double-double with 11 points and 13 boards while drawing a comparison to Dennis Rodman from Fran Franschilla. Speaking of Fran, he took advantage of the chance to grab a photo with his favorite Mountaineer guard. It comes as no surprise to Mountaineer fans that Jevon Carter got some work in while visiting Morgantown. Carter even made an appearance in the booth and took over color commentary for a while. It happened to coincide with the 14-0 run by the Wildcats that put the game away. That didn’t go unnoticed by Jevon. With a brutal season coming to an end there are a few rays of sunshine. For instance, the freshman duo of Brandon Knapper and Derek Culver have established themselves as steady contributors and give WVO two building blocks for the 2019-2020 season. Perhaps inspired by Jevon Carter, Jordan McCabe went straight to work after the game and started putting up shot after shot. Despite the loss, it was great to see Jevon Carter back in the Coliseum. The respect and admiration him and Bob Huggins share for one another is something to see. In case you missed it, you can check out our exclusive interview with Jevon Carter here. Up next the Mountaineers have a trip to Baylor on Saturday. The game is set to tip off at 2:00 p.m.